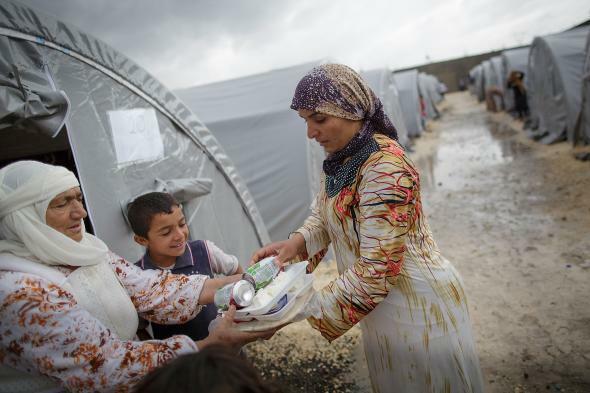 U.N. World Food Programme cuts Syria refugee aid. A Syrian refugee camp in southern Turkey. The United Nations’ food aid agency announced on Monday that lack of funds is forcing the organization to suspend food assistance to some 1.7 million Syrian refugees. “The program, which provides electronic vouchers for Syrian refugees in Lebanon, Jordan, Turkey, Iraq and Egypt to buy food at local stores, faces a $64 million shortfall, the agency said, attributing the problem to ‘unfulfilled’ donor commitments,” the Washington Post reports. “The United States gave the agency $125 million last week: $70 million to cover the cost of refugee vouchers in November, and $55 million to support food deliveries to about four million people in Syria until year’s end,” according to the Times.